Chris Thomas is a very busy man and he’s been that way for quite a long time. At age sixteen he scored several films and stage productions in addition to winning a state composition title and having a live performance. This would be the first of many other award recognitions for his work. He went on to score numerous films and television shows and founded Stinkbug Music International. Somehow he also found time to write music for haunted attractions as “Music For Haunts.” I don’t just mean he creates albums with the hope haunted attractions will use it. He actually composes music for various haunted attractions around the country! Music For Haunts isn’t just a one man operation. In the case of A Child’s Nightmare, the creepy album artwork is by Sam Templeman, the lyrics were written by Justin Meyer and the vocal solos were performed by Monika Beal, Ellen Reid, Justin Meyer and Chris Thomas. Strings and creepy laughter usher us into “A Child’s Nightmare.” In addition to a circus-like music box and woman singing, there are numerous comments (and sobbing) from unearthly children. Said children are portrayed by Monika Beal and Ellen Reid and this is one case where an adult pretending to be a child actually works in the audio’s favor. Since the children sound a bit “off,” it gives the impression they are something disguised as little kids. Human or not, those little creeps show up in numerous tracks over the course of the album. The wordless unisex vocals, The Nightmare Before Christmas-style piano work and spooky organ work also add to the track’s overall mood. Said mood allows for use in scenes like a haunted nursery, doll room or circus. Speaking of circuses, “The Ringmaster’s Music Box” would also be a great track to use in one. A crackling record plays the sounds of a music box (of course) and soft wind, which are soon joined by a creepy kid singing. The audio transition where a woman joins in is especially well done, as are the tittering and comments by the unnerving little ones. “Cult Sacrifice” features a soft and slow spooky piano buildup coupled with strings. I love the “stabbing” musical notes and they also remind me of a countdown clock. As you would expect from a cult, there’s soft chanting in the background and singing in Latin. This could easily be used in a scene where a cult sacrifices someone (perhaps a “victim” planted in the audience) or you could just have a bloody altar and have this play once people get close enough. The spooky stuff is surprisingly low key in “The Karnevil.” It’s mostly happy merry-go-round music (calliope, bells and touches of drums), but a dark tone slowly creeps in. If you have a decrepit merry-go-round area in your haunt, this is the track for you! The super soft musical buildup of “Violins Leaking From Hell” eventually goes from barely audible to a loud mix of spooky effects and violins. Said violins can sound like guitars at times and the pounding musical tones just might remind you of Terminator 2: Judgment Day. The other rock-style touches allow for use in a “Haunted House of Rock” or in a room where a séance is being held. More specifically, a séance where a glowing violin mysteriously appears and starts playing after the lights go out. Just have an assistant dressed in all black come out of hiding and uncover a prop violin painted in luminous paint. Thanks to the soft opening fade, they should have enough time to being “playing” as the music starts. “Gonna Make You BBQ” is heard on what appears to be a malfunctioning player, as it constantly stops and “rewinds.” It sounds happy and innocent at first, but the distorted singers’ love of meat can be off-putting. Hearing the titular line get repeated over and over again and having it sound eviler each time really drives home the double meaning of the phrase. I suggest leading your guests into a rundown barbecue joint. But don’t have the evil employees come out until the song starts repeating the title. For a real scare, have them sneak up on the guests rather than come out in front of them. In “Noise In The Basement,” snippets of spooky music and moans fade in and out. A burst of piano and screeching violins about a minute in which makes things somewhat more constant. The nervous violin work really picks up at end and flows nicely into the next track. Said track is “The Apparition” and it has plenty of soft and nervous violins. The soft piano, wordless female vocals and other spooky touches greatly add to the effect. Both tracks can be used in just about any haunted house scene, but something involving ghosts is a huge plus. Perhaps a haunted library, attic or basement? The music box and distorted creepy child singing which open “We Are The Klownz!” get warped and taken over by evil laughter and rockin’ guitars. This leads into an actual rock song about evil clowns with the creepy kids acting as the chorus! If you aren’t doing a “Haunted House of Rock,” this is still great to listen to on its own. The soft buildup of “Satan’s Microphone” leads us to evil effects, the sound of flames and dark tones. It has to be heard in order to be truly understood. The intense buildup and creepy guitar screeches towards end are great touches. This would be perfect for a maze of some sort or a haunted boiler room. Being over twelve minutes in length, “Verfelgte” is the longest track on the album. The title seems to be a corruption of the German term for victims of persecution, which would explain the track’s feel. Although there is some music, like brief burst of violins, it mostly consists of sound effects. There’s soft wind, clanking chains, creaking gates, dripping, eerie chimes, crackling flames, storm effects and so much more. The evil laughter and breathing let you know you aren’t alone. I can see this working in a dungeon, hallway or dark maze. 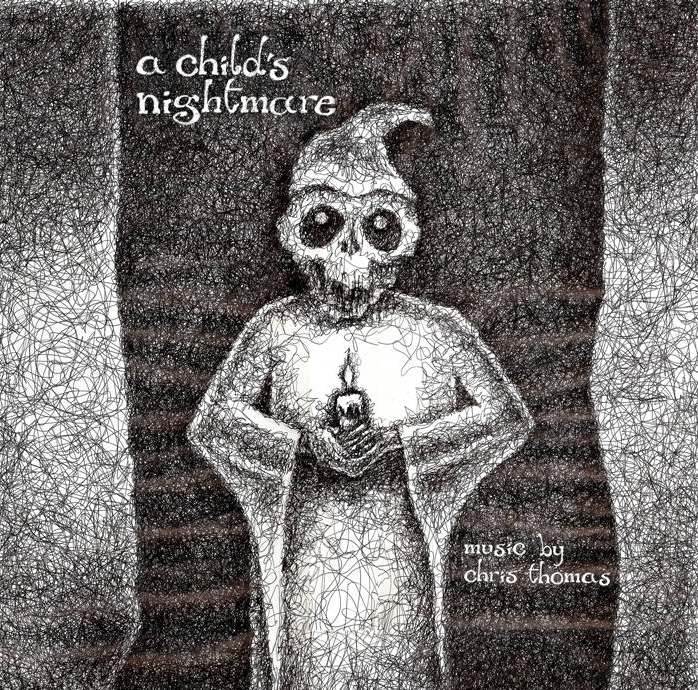 A Child’s Nightmare offers an impressive and varied selection of tracks field-tested in professional theme park events and haunted attractions. Each track is long enough to allow individual looping without becoming mind-numbingly annoying, especially “Verfelgte.” While I’m sure there are some Halloween displays with which the entire album could be looped, it seems likely most purchasers will pick and choose select tracks. If you operate a home haunt, charity haunt or haunted attraction which gets up to 10,000 customers, then I have some great news for you: Music For Haunts’ albums are all available for use in said haunts royalty free! All you need to do is buy the album, provide credit to Chris Thomas on your website with a link to his site and contact him. If you let him know what scenes you will be using his work in, it will help him publicize your haunted attraction! Everyone else should contact him to discuss licensing arrangements, which I found to be more than fair. And, yes, I said “albums.” Chris Thomas followed the 2011 release of A Child’s Nightmare with Church of Torment in 2012 and Souls of Darkness in 2014. I’m sure he will have even more releases in the future. I’m just as sure I’ll be reviewing more of his work in the coming years.